You are currently browsing the tag archive for the ‘Dave King’ tag. 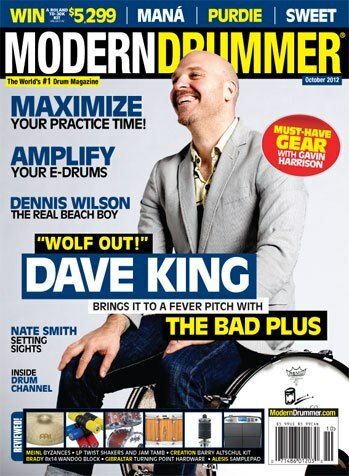 My former teacher Dave King is featured in this month’s Modern Drummer magazine. The article is fantastic and Dave’s insights are so valuable. Reading it really reminded me of the hours and hours I spent listening to his wisdom and passion for music/art during our lessons and hangs. No single person has shaped my perspectives on how to do what I do more than Dave. Hit a drum shop and get yourself a copy asap. My dear and infamous friend Dave King released a solo record yesterday called Indelicate. The album is just drums/piano – a duet with himself (he performed both instruments). Here are some other people’s reviews: AllAboutJazz.com, LATimes.com. And here is an interview with Dave on this past weekend’s The Local Show on 89.3 The Current. You should probably prioritize listening to the interview, that is, if you like listening to things that are interesting, funny, and inspiring. In case you were wondering, he’s blowing over an ostinato in seven, which exponentially increases the difficulty of landing the sick ideas that he’s dropping. Like… the stuff starting at 1:43… those lines are not only great compositionally, but he’s weaving them into an odd time signature! Nice. Joey is a guy that Dave King pointed me toward, and one of the better examples of his playing is the live Bill Frisell record that I featured in the AEDSK list. I also really love the stuff he plays in Masada (John Zorn’s band from the above youtube clip), and an older John Scofield record called Grace Under Pressure. Relentlessly creative, The Bad Plus will drop their new studio album on Feb 3rd, which features Twin Cities vocalist Wendy Lewis. Some of the tracks are posted on their myspace, in which you will hear my former teacher Dave King tearing holes in the minds of jazz drummers everywhere. My good buddy Chris Morrissey, bassist for the Bill Mike Band, no longer lives in Minneapolis. On an unrelated note, Chris will soon release his debut recording as a band leader, in which you will again hear my former teacher’s mind-tearing tendencies. I’m playing at Bunker’s this Saturday night with my friend Ryan Paul, and we recently got a nice write-up from Ruby Vox on the isroxxor blog. My daughter Betty got a shout-out on my buddy Bryan’s blog. Here’s a cool interview with my former teacher, David King. I found it the other night. In it he discusses an avant garde piano trio he’s in, The Bad Plus, and their adventures with record labels. Notice toward the end of the clip when the interviewer completely botches her facts on the Nirvana cover that The Bad Plus did on their first record. Awesome. The pick for the third installment of Album of the Week is Haley Bonar’s new record, Big Star. Haley is a friend of mine from the music scene in Minneapolis, and the rest of the band members on this recording are also Minneapolis musicians: Dave King on drums (my former teacher), Bill Mike on guitars (from the Bill Mike Band), and Chris Morrissey on bass/vocals (also from the Bill Mike Band). BUT, Big Star isn’t the new Album of the Week just because the musicians are my friends. It is a truly incredible record. The music follows a standard folk formula, with the typical focus on song writing and melody, but includes sonic landscaping reminiscent of Death Cab meets Fiona Apple. The record was tracked at Pachyderm Studios and mixed by the world-renowned Tchad Blake, which keeps the quality from sounding sub-par or “indie” (even though the entire production was managed on just a small percentage of a major label budget). The “indie” spirit and creativity is still present, however. And then, sitting comfortably on top of all of this, is Haley’s voice, which is one of the most unique-yet-soothing female vocal that I have ever heard. The readers of this blog that are familiar with Dave King and the rest of his discography will be blown away by the way King is able to retain his personality on the drum set while still serving the music of a folk record. His feel is of course incredible, but the real magic of King’s playing on Big Star is the approach and treatment that he gives to each tune. At no point does he infringe on the style of the music, and yet almost every track contains unique and forward-thinking ideas for folk drumming. Everyone should at the very least go visit Haley’s Myspace page and listen to a couple of the tracks, and you can also find info there on her tour dates and other happenings. Not really a hockey fan, just a fan of looking cool. 1) The avant-garde jazz trio Happy Apple. You can hear some of their latest tracks here, and you can listen to this interesting NPR report on the band. 2) The art/pop-electro/rock band Halloween Alaska. Check out their myspace and watch this documentary of their second record. 3) The world-renowned progressive jazz trio The Bad Plus. Listen to them here, and watch them here. 4) The indie-rock band Love-Cars. Check them out here. 5) The raucous collision of sounds called The Gang Font. This is a band King started with Greg Norton (the bassist from Husker Du). You can watch this interview and performance from their first show. In addition to all these bands, King has also recorded and performed with Jeff Beck, The Jayhawks, Iffy, FKG, Craig Taborn, Tim Berne, 12RODS, Haley Bonar, Mason Jennings, Bill Carrothers, and many others. 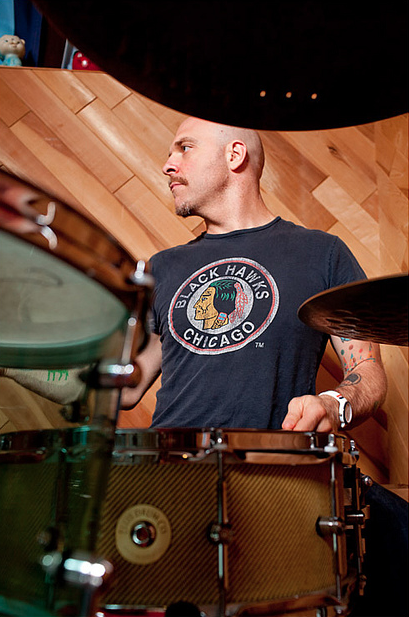 You can check out his Zildjian artist profile here, and there’s a Modern Drummer Magazine article on him here. UPDATE: Some of Dave’s recent endeavors as a bandleader include a trio record called I’ve Been Ringing You, a Dave King Trucking Company record called Good Old Light, and an interesting solo album called Indelicate. Furthermore, if you want get a glimpse of Dave’s comedy side, scroll through his blog posts (explicit content). Also worth watching are the handful of YouTube interviews with him like this and this… and there’s even a full-length MOVIE on him. In a pop/rock studio environment, the tone of your snare is the biggest factor in establishing a particular vibe or feel for a song (as far as the drummer is concerned). The entire sonic landscape of your groove will change as your snare tone changes. A rimshot is a great way to capture a vibrant and energetic sound… but that’s not always what you want. For example, the current “new face” on the female pop scene is Sara Bareilles, with her single “Love Song.” Matt Chamberlain played on that track (a player I greatly admire), and his snare is a big, fat rimshot with tons of life. However, track 7 on that disc (“Between the Lines”) is a totally different snare tone. Chamberlain used a dark, papery sound on track 7, with a lot less “crack” and a lot more “push.” It’s most likely a different drum entirely, but odds are it’s also heavily doctored. 1) Newspaper. Throw a couple sheets of newspaper on your drum and just let them sit loosely on the head while you play. It’s a cool vintage sound that muffles some of the ring (depending on how many sheets you put on there). Notebook paper works too… but newspaper has a slightly different sound to it that I like better. 2) A towel. Or maybe a T-shirt… or a pillow case. They all have different thickness so try each one – my favorite is the pillowcase. Cut it up so it’s only 1-ply (but large enough to cover the whole drum) and then just drape it over the drumhead. This is another “muffled” sound but it’s characteristics are totally different than the newspaper. 3) A block of wood. More muffling with a different sound quality. I totally stole this from Steve Jordan when I saw him doing it on his DVD, “The Groove Is Here.” I’ve tried it a few times and it works great. Grab a somewhat thin piece of wood (like a 2×4 or something… maybe 6 inches long) and set if up on the top portion of the head (close to your rack tom). Tape it down a little so it doesn’t bounce. Guys will often use their wallet for a similar sound, but the wood block has it’s own vibe. 4) Your keys. Seriously… your car keys or something. This is another idea I picked up from my former teacher Dave King. Just set your keys on the head off to the side. It’s a really cool “synthetic” sound, like a drum machine or something. This same idea can work with a small tambourine. 5) Splash cymbal. This is one that I discovered on my own and it totally rules. Get a small splash (6-8″) and set it on the head off to the right. Then play the drum off to the other side, a little left of center. A really cool techno sound happens here, and you can mess around with hitting the splash itself from time to time as an accent. Try each of these out for yourself… they all have different results and you should get a feel for the personality of each one. Listen, I know this is my 3rd post in one hour, but I just started this blog today so I feel like I need to fill it up a little. Actually, I think I’ve figured out how to add pictures to the posts so I’m going to try it. This is a work by Jean-Michel Basquiat, an 80’s Neo-Expressionist from Manhattan. It’s titled “Max Roach,” after the Jazz founding-father and drumming legend of the same name. 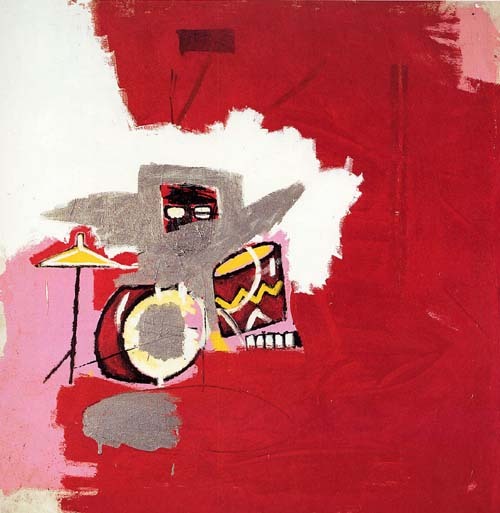 Roach had a massive influence on the evolution of jazz drumming, and Basquait just nails the essence of Roach’s sound in depicting him as cloud hovering behind the drumset. Basquiat was heavily influenced by Jazz and Jazz musicians throughout his career. If a painter (visual) can draw inspiration from a musician (audio), then that transaction can definitely take place the other direction as well. In college I studied with the internationally-acclaimed, avante-garde drummer David King. Dave was CONSTANTLY referencing paintings and films in the lessons (which is where I first learned about Basquiat), which didn’t make much sense to me at first, but over time I began to see the connection that he was drawing on – the connection that exists between all forms of art. Creativity is art’s essence, and the creative process is so much bigger than any one genre of art (or music, for that matter).